Hello and Welcome to our preview for Dhaka Dynamites vs Chittagong Vikings match. 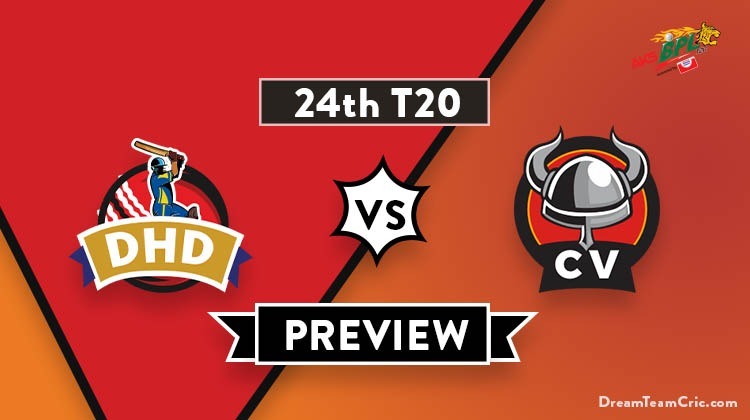 We are covering DHD vs CV Dream11 Team Prediction, Preview and Probable Playing XI for the Bangladesh Premier League 2019 match. The match is to be played at Shere Bangla National Stadium. Table-toppers Dhaka Dynamites are in good form and have won five out of their six encounters. They won their last match against Sylhet Sixers by 6 wickets. Bowling first, Andrew Birch took three-wicket haul while Shakib took two wickets to restrict Sixers at 158. Skipper Shakib along with Russell chased the target comfortably scoring 61* and 40* respectively. They will hope to continue their dominance and register another victory tomorrow. Chittagong Vikings are second on the points table with four wins and one loss. They won their last match against Khulna Titans by 26 runs. Batting first, They gave a whopping target of 215 to Khulna with Yasir Ali, Mushfiqur Rahim, Dasun Shanaka and M Shahzad scoring handy knocks. Abu Jayed starred with the ball taking three scalps while Delport and Khaled Ahmed took two scalps each to successfully defend the target. They will hope to give a tough challenge to mighty Dhaka Dynamites team. DHD vs CV, 24th match, Bangladesh Premier League 2019. Shakib Al Hasan (c), Sunil Narine, Rovman Powell, Kieron Pollard, Andre Russell, Hazratullah Zazai, Rubel Hossain, Nurul Hasan, Rony Talukdar, Shuvagata Hom, Andrew Birch, Ian Bell, Qazi Onik, Mizanur Rahman, Asif Hasan, Shahadat Hossain, Mohammad Naim, Mohor Sheikh. Mushfiqur Rahim (c), Abu Jayed, Luke Ronchi, Sunzamul Islam, Dasun Shanaka, Sikandar Raza, Robert Frylinck, Mosaddek Hossain Saikat, Khaled Ahmed, Nayeem Hasan, Cameron Delport, Mohammad Ashraful, Robiul Haque, Yasir Ali, Nihaduzzaman, Mohammad Shahzad, Najibullah Zadran, Shadman Islam. Ian Bell or Kieron Pollard or Hazratullah Zazai can replace Darwish Rasooli in the playing XI. South African batsman Heino Kuhn has joined the team. Aliss Islam was lifted off the field in last match due to some leg injury. He will be doubtful in this match. Shuvagata Hom can come back in the playing XI replacing Mohammad Naim or Aliss Islam. Sunil Narine and Mizanur Rahman can open the innings. R Talukdar, Shakib Al Hasan, Andre Russell and Nurul Hasan will follow them. Rubel Hossain, A Birch and Andre Russell will be the key pacers while Shakib and Narine will lead the spin attack. Ian Bell does not played a match in this season so He can also get a chance in any match. Robbie Frylinck was in impressive form with the bat as well as the ball but still was replaced in the last match and can return to the playing XI. Place of Sunzamul Islam can also be little risky and Robiul Haque can replace him. Cameron Delport and Mohammad Shahzad will open the innings. Yasir Ali, Mushfiqur Rahim and Dasun Shanaka will follow them. Mosaddek Hossain, Nayeem Hasan and Dasun Shanaka will play the role of an allrounder. Nayeem Hasan and Sunzamul Islam will lead the spin attack along with Mosaddek Hossain while Abu Jayed and Khaled Ahmed will be the key pacers along with Cameron Delport. Sunil Narine, Ian Bell/Mizanur Rahman, Rony Talukdar, Shakib Al Hasan (c), Andre Russell, K Pollard/D Rasooli/Mizanpur Rahman, Nurul Hasan (wk), Mohammad Naim/Shuvagata Hom, Andrew Birch, Rubel Hossain, Shuvagata Hom/Aliss Islam. Mohammad Shahzad, Cameron Delport, Yasir Ali, Mushfiqur Rahim (c and wk), Dasun Shanaka, Najibullah Zadran/R Frylinck, Mosaddek Hossain, Nayeem Hasan, Sunzamul Islam/Robiul Haque, Abu Jayed, Khaled Ahmed. Captain and Vc choices: Shakib Al Hasan, C Delport, Sunil Narine, Mohammad Shahzad, M Rahim, Andre Russell. If you liked DHD vs CV Dream11 prediction, then follow us on Twitter for Latest Cricket News and Grand League Teams.